Humanity has a long and interesting artistic history dating back to a time before we developed spoken language. Art and illustrations served as an easy and understandable method of conveying thoughts and feelings. 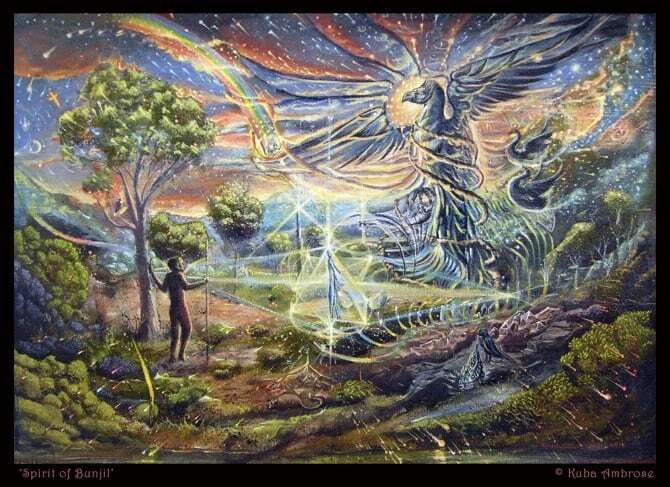 Visionary art is the manifestation of these thoughts and feelings experienced in another state of consciousness and that are indescribable except through art as the medium. As an artist falls into and is engulfed by the painting they are striving to produce, the artist is pulling out from the creative universe within. Art in all spectrums is a result of an inner drive to manifest physically what the universe wants to create through one’s consciousness. Art is made through us, not out of us. When a traveler enters the psychedelic state, new synapses are created or recreated which allows the person to “trip”. In this state of consciousness, individuals tend to think and see outside of their regularly programmed experience. As a result of this broadened perspective, one can appreciate new perspectives of a painting they have always seen or hear new sounds in a track they were already familiar with. Now what do we do with this new perspective creatively? Trippers often see images printed onto a blank canvas such as a wall, or see new patterns in an already visually stimulating carpet. Often at times, people will try to draw what they see directly or artists will be inclined to include aspects of these images into the art they manifest about a certain experience or feeling during a trip. Under the influence of a psychedelic, many individuals claim that they connect to the god head of the universe or “that space in which the universes creativity came from.” Is it possible that being connected to this space allows for artists and musicians to create beautifully elaborate art? “Research studies by Willis Harman, James Fadiman, Oscar Janiger, and others have confirmed that something substantial underlies these claims. These studies provide compelling evidence that not only can LSD and other psychedelics significantly enhance the imagination, inspire novel thought, and strengthen problem-solving abilities–they can actually improve creativity and artistic performance.” This increase in appreciation and creative skill of art and music may come from being connected to that creative universal space. Also, in a psychedelic state of consciousness, it seems that a lot of social barriers and programs are broken down, allowing an individual to think outside of the regular construct in which they function. By functioning outside of a “program”, one is able to think more creatively and abstractly which would allow someone to figure out the solution to a problem more creatively. Willis Harman studied this in his lab. He took participants that brought in a professional real problem to solve and analyzed the creative thinking before taking the psychedelic, mescaline, and after. Harman took the solutions participants had come up with and had them evaluated. Virtually all participants scored high on the creative problem solving curriculum. It seems that psychedelics have a profound effect on an individual creatively. One becomes more appreciative of art and music, they are inspired by the experience to create, and by deconditioning the social programming individuals are able to think abstractly and creatively and connect to the universal god head that holds the creative power of our infinite universe. Picasso said: “We all know that Art is not truth. Art is a lie that makes us realize truth at least the truth that is given us to understand. The artist must know the manner whereby to convince others of the truthfulness of his lies.” So it is “a succession of object-stimuli that might be used to lead the subject beyond the aesthetic appreciation of the thing to meaningful examination of his own life.” Through the beautiful creation of music and art, one can see and hear the meaning of the work, and this can lead one to analyze their own life and spark something significant from it. It is in this psychedelic state that many of the worlds renowned artists, musicians, thinkers, philosophers, and scientists have manifested significant pieces that help shape the social culture. Hancock, Graham. “The Divine Spark: A Graham Hancock Reader.” Google Books. N.p., n.d. Web. 13 July 2015. .
Hannes, Peter. “Art, Aesthetic.” LSD Experience RSS. N.p., 27 Aug. 2010. Web. 13 July 2015. .
Brown, David Jay. 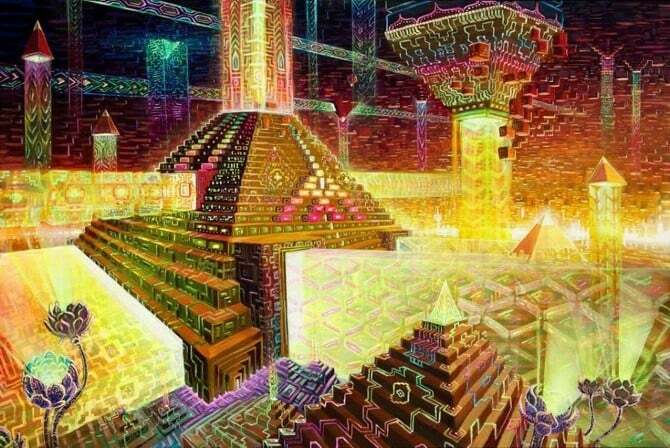 “Can Psychedelic Drugs Enhance Creativity?” Santa Cruz, California Patch. N.p., 26 July 2012. Web. 13 July 2015. .
Opar, Susan. “Can Hallucinogens Make You Creative?” Siena.edu. N.p., n.d. Web. 13 July 2015. .
Palmer, Brian. “Could Acid Make You As Creative as Steve Jobs?” Slate.com. N.p., n.d. Web. 13 July 2015.